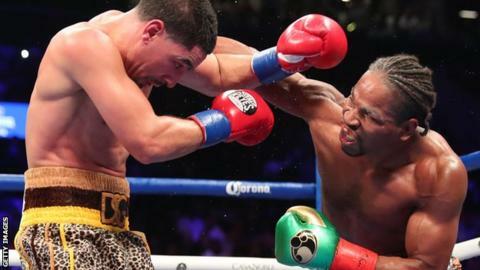 Shawn Porter became a world champion for the second time as a points win over Danny Garcia in New York earned him the WBC welterweight title. Porter, who lost the IBF title to Britain's Kell Brook in 2014, grew into the bout against the fellow American. His brawling style caught the eye late on for a unanimous 116-112 115-113 115-113 win to land the vacant title. Afterwards, Porter said a bout with IBF champion Errol Spence Jr was "the easiest fight in boxing to make". American Spence joined Porter, 30, in the ring and the pair embraced after saying they would be keen on a unification bout. WBA world champion Keith Thurman - who gave up the WBC belt as he battled injury - was also ringside at the Barclays Center. Thurman beat compatriot Porter in 2016 and defeated Garcia in his last outing in March 2017 to hold both the WBA and WBC titles, but has not been able to compete since. In California, Donnie Nietes maintained his 14-year unbeaten record but failed in his bid to become a champion in four different weight classes after a draw with fellow Filipino Aston Palicte. The pair were fighting for the WBO super-flyweight title, which will remain vacant after one judge scored the bout 118-110 for 36-year-old Nietes, another 116-112 for Palicte, 27, and the third had it at 114-114. Nietes, who has not lost in 34 fights since 2004, had previously become the WBO strawweight champion in 2007, the WBO light-flyweight champion in 2011 and the IBF flyweight champion in April 2017.